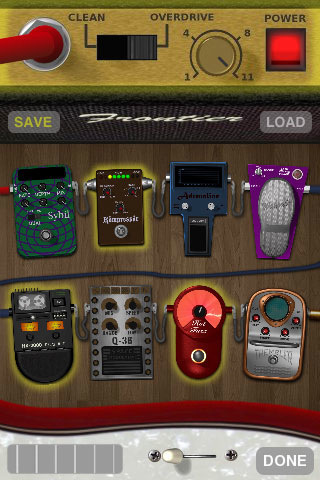 ◦ Wahsabi: Tilt your iPhone to control this wah pedal! As with Guitar, our advanced acoustic guitar app, iShred provides a playing interface that’s both powerful and easy to learn. Create your songs from a huge library of over 2000 built-in chords, scales, and fret positions, by assigning them to the two rows of buttons at the top of the screen. The buttons give you immediate access to all the chords and scales you need for a song, and let you easily switch between strumming chords and playing melodies. ✓ “AirPlay” acts as a pocket-guide to shared songs from around the world, letting you rate, save, and learn performances from other users.